The Nigerian Army said its soldiers on counter-insurgency operations in the North East have killed many terrorists and recovered several stolen livestock from the thme in Borno State. 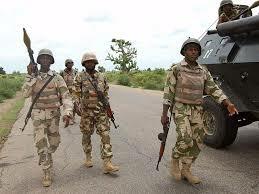 The soldiers from Sector 3 Operation LAFIYA DOLE, in conjunction with 82 Task Force Battalion, were said to be on a long range clearance patrol at Gesada village, in Guzamala Local Government Area Borno State, when they encountered the terrorists. Director, Army Public Relations, Brig.-Gen. Texas Chukwu, who made this known in a statement, said the soldiers also recovered arms and ammunition from the terrorists who stormed the village to extort money and rustle livestock. Chukwu in the statement said, “Troops of Sector 3 Operation LAFIYA DOLE, in conjunction with 82 Task Force Battalion. following a tip-off, embarked on a long range clearance and link up patrol resulting in the killing of many Boko Haram terrorists in Gesada village, Guzamala Local Government Area Borno State. “The terrorists met their waterloo when they came to the village to extort money and rustle livestock belonging to the villagers. “Similarly, troops returned 147 livestock recovered from Boko Haram terrorists in Matasari village to their owners after proper screening and confirmation by the Bulama and Civilian Joint Task Force in Jentilo village of Kukawa Local Government Area”.